1. In a medium bowl, stir together the flour and baking powder and set aside. 2. In the bowl of an electric mixer, using the paddle attachement, cream together the butter and sugar until light and fluffy. This should take about 3 minutes. 3. Add the egg and vanilla and beat another minute or so. 4. Add the flour mixture slowly being careful to not add too much at a time or you will have a snowstorm in your face! 5. Blend until all the flour is incorporated and the dough begins to pull away from the sides of the bowl. 6. Take the dough out of the bowl and place it on a piece of plastic wrap. Wrap it up into a disc and place in the fridge for about 2 hours. If you want to speed up the chilling process, place the dough into the freezer for 20-30 minutes. Just don't forget about it in the freezer or your going to have to wait a while for it to thaw out. 8. When the dough has chilled and is firm, take out about half the dough, leaving the rest in the fridge (until your ready to work with it). 9. Place the dough on a lightly floured work surface. Place a piece of parchment paper on top of the dough. This helps you roll out the dough without having to use more flour, which can make the dough a bit tough. 10. 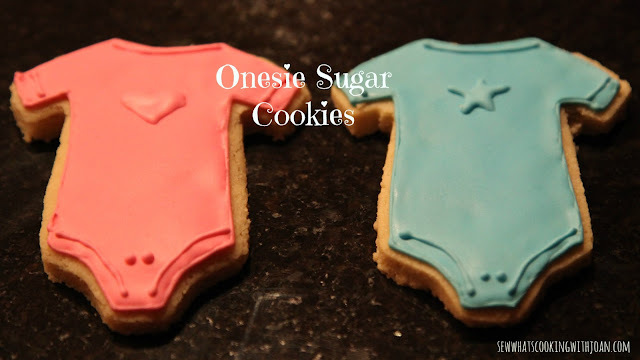 Roll out the dough to about 1/3-inch thick and cut with the cutter of your choice, in this case, it was a onesie. 11. Bake cookies for 8-10 minutes depending on the size of the cookie. bake until they are just barely beginning to take on a golden tone. They will continue to bake once you take them out of the oven and let them cool on the pan. This recipe will yield about 30, 2 1/2 inch cookies or 16, 3 1/2 inch cookies. Now you are ready to decorate!! 1. Beat all ingredients until stiff peaks form. 2. Spoon some of the thick white icing into individual bowls and add coloring. 3. Feel free to add additional water to the icing to achieve the consistency you need. 4. 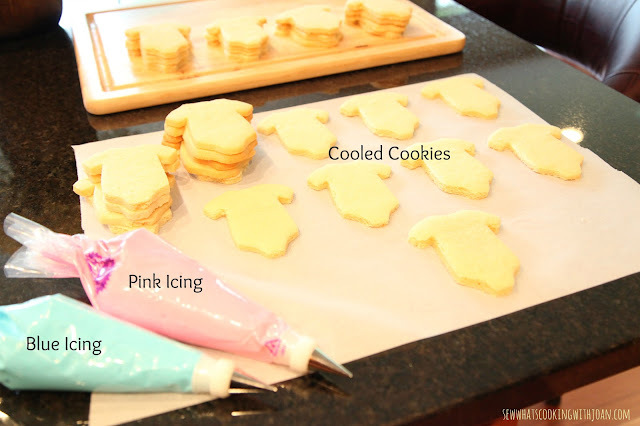 Fill piping bags with icing and have fun outlining, flooding and decorating!! Note that once you flood the cookies, you must wait several hours to let it set before you decorate over it. I'm hope everyone at the party likes these!! They are all packaged and ready to go. If you are feeling intimidated to take a stab at making royal icing sugar cookies...don't be! With some time and patience, you will get the hang of it very quickly. I will need a dose of patience!! Thank the Lord...we have Amy!! Everyone loved the cookies!! Amy is amazing!! I am taking my cookie to work on Monday along with my beads so everyone will know when I walk in the door what it is. The cookies are very cute and look so professional - I don't think i can eat it since it is so cute but Mike had his gone last night and said it was yummy - Amy you are amazing. Thank you kindly! I am really enjoying all these opportunities to make the cookies as all the siblings have their babies! 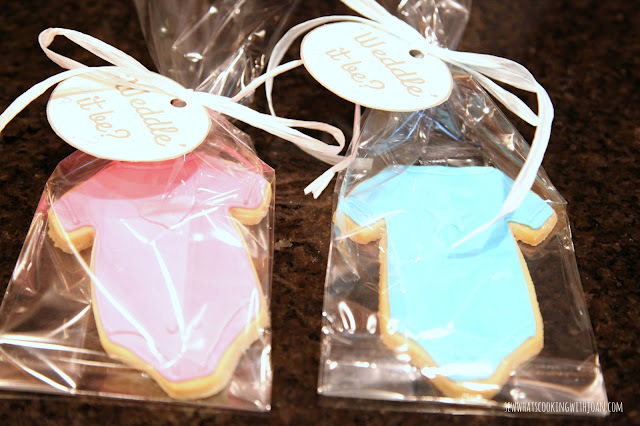 I am already thinking about cookies for Holly's shower!